Alto Estates winemaker Bertho van der Westhuizen shows off some new and earlier vintages. He’s one of those people that never looks shaken, even in the private dining room at The Four Seasons Westcliff with the sometimes daunting brutalist structures of Braamfontein Hill behind him. Maybe it’s the red wine. It’s good for the heart, lowers cholesterol and has been proven to increase your mood. Maybe that’s why Bertho van der Westhuizen – winemaker at Alto Wine Estate (which only produces red wines) – is so happy. Maybe it’s the fact that he’s sharing something brand new. “It’s a Cabernet Sauvignon Rosé,” he says, handing over a glass of blush wine. It’s his second Cab Rosé, made in very limited quantities (the bottles on the day didn’t even carry labels). Alto is known for it’s red varietals Shiraz and Cabarnet Sauvignon, as well as its red blend Rouge, and that’s the business of the day. Compare the 2015 vintage of each with the just-released 2016 vintages. Playing with previous and current vintages is a fun way to really see how keen winemaking, a little extra age and a walkthrough helps elevate each release. Staring with Alto Shiraz 2015 and 2016; paired with red wine, poached kingklip, lentils with bacon and celery and turnips, Van der Westhuizen believes the 2015 is becoming richer and more rounded. The 2015 has a bouquet of blackcurrant and prunes and delivers a full-bodied wine with hints of spice and prune and plum flavours. The 2016 leans toward the side of wood spice, pepper and red fruit. While a touch sweeter, this is also a wine that will age marvellously, according to Van der Westhuizen. 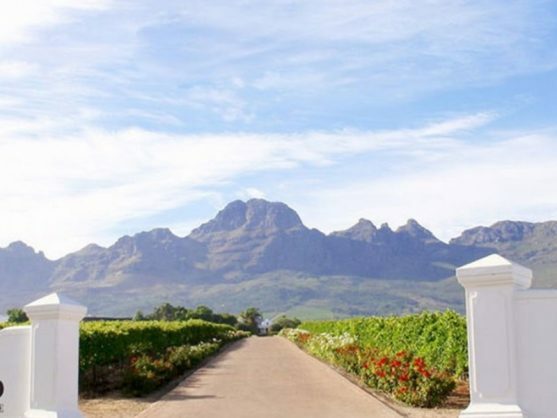 Alto dates back to 1693 and has continuously produced high-standard wines and 2015 was particularly kind – especially for his Alto Rouge – a red blend that in not only consumer conscious, but also incredibly good. For the team at Alto, the 2015 Rouge was one of the best vintages in recent years. It holds special significance for Van der Westhuizen, who took over from his father, Schalk, as winemaker on May 1 of that year. “My father finished fermentation of the harvest and together we put the wines in barrels. My job was easy considering how good the harvest was,” he says. That particular vintage was also one to include Petir Verdot in the blend, which helped create its richness. Harvesting at Alto traditionally only starts near the end of February or the start of March due to cool Southern breezes. This ensures gradual ripening. The five varietals – Shiraz, Cabarnet Franc, Merlot and Petit Verdot – were all handpicked. What makes Van der Westhuisen’s job fun is that all these varietals ripen at differents times and as a result each is vinified separately and fermented on the skins. The 2015 and 2016 Rouge were aged for 18 months in a combination of first, second and third fill barrels before the desired blend was made. “The Rouge shows what grapes are on the farm,” Van der Weshuizen says. Each one meant to show the marvellous fruit from Hutton and Glenrosa soils but also the influence of altitude on the farm. Some slopes are around 500 metres above sea level. Rouge is a way where you don’t have to commit to only one varietal but you get an idea of the entire Alto stable of wines. The Rouge is also a chameleon, worth drinking by itself, but great paired as well. The 2016 has a great resemblance to 2015 – meaning it’s time to get it in the cellar to really enjoy the best of Alto. Maybe that’s what keeps Van der Westhuizen so unshaken – the knowledge that he’s behind a range of wines that’s for now, and later.